Sweet tea leaves, jasmine, rose, geranium, clove, peach and vanilla. Smelling the wax for the first time… it did smell just like an herbal tea. I could detect all the elements in the description minus the rose and jasmine. The overall scent was lovely. I started this candle in my master bedroom… it’s a pretty big room so I wanted to see how it performed there and I’m happy to report… it did great. I lit this candle early morning and came back an hour later to my entire room filled with the fresh aroma of Sweet Tea. It smelled really fresh and bright… I loved it! As far as the description goes… I mostly detected sweet tea leaves, peach and vanilla. I still wasn’t sure about the floral notes and I almost want to say I could detect a bit of licorice in the mix too. Strength – on a scale of 1 to 10, I would rate this candle an 8 in a large room and a 10 in small to medium rooms. This candle gave a great scent throw. LOVED!! My candle burned perfect. Zero issues. Clean and even burn. I absolutely LOVED this fragrance and am sad it’s been discontinued. Village, if you’re reading this review, please bring Sweet Tea back. It truly was an amazing scent. I do notice Village has a new tea fragrance I plan on trying. They do say it’s similar so we shall see. Stay tuned, I’ll probably purchase one to review. 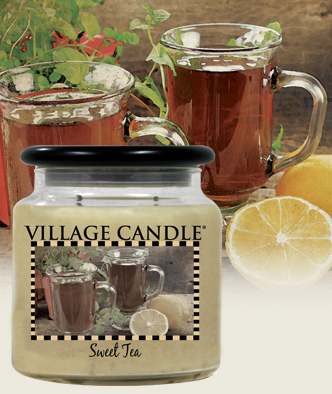 Have you tried Sweet Tea from Village Candle? Review it with us. In the comment section below, review and star rate your experience… it’s easy! Scent description - Sweet tea leaves, jasmine, rose, geranium, clove, peach and vanilla.